Check Rates & Availability at BEST WESTERN Paint Pony Lodge! 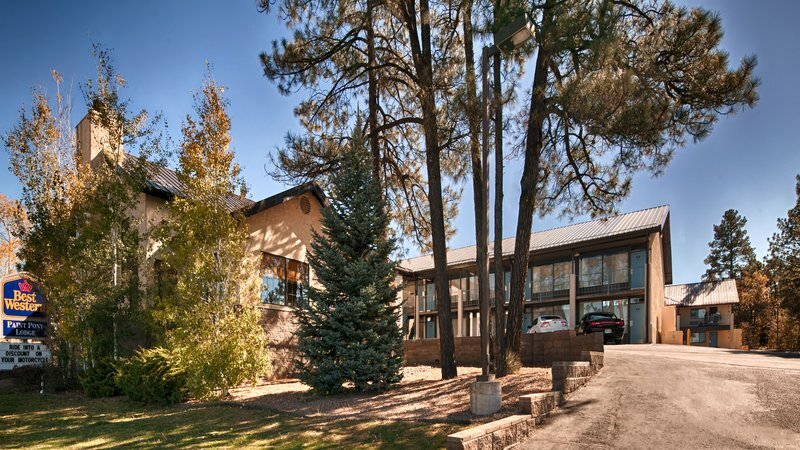 Take in the beauty of Ponderosa Pines at this Show Low, Arizona hotel. Travelers to Arizona will find the Best Western Paint Pony Lodge to be a great value with all the comforts of home in Show Low. This hotel offers all of the high-standard of amenities and service that Best Western is known for. The warm and friendly staff of the Best Western Paint Pony Lodge strives to make every guest's stay as comfortable as possible! A complimentary hot breakfast is served every morning in the spacious lobby by a cozy fireplace. Every afternoon, the hotel serves complimentary homemade cookies and fresh brewed coffee for guests. Each room is equipped with free high-speed Internet, a microwave, refrigerator and cable television with HBO . Deluxe Honeymoon and Presidential Suites are available. The Show Low area offers year-round outdoor activities that nature lovers seek. The Arizona White Mountains feature world-class skiing, snowboarding, horseback riding, golfing, hiking, and fishing! Make an online reservation today at the Best Western Paint Pony Lodge in Show Low Arizona, offering guests the right location with great amenities at a great rate. From: Highway 60. The Best Western Paint Pony Lodge is located on the West end of Show Low on Highway 60 and 260, across from K-Mart and Safeway. Adjacent to Licanos Mexican Food, full service, Mexican, open for: lunch, dinner, Licanos Mexican Food and Steak House is located adjacent to our property. It is a full service restaurance and cocktail lounge.